ViewCompanion Pro™ is a very powerful, but easy to use application that can view, annotate, print and convert DWF to PDF, DXF, CGM, PLT, TIFF, CALS and other formats. Open Autodesk DWF 2D files. Open Autodesk DWFx 2D files. Open other file formats including Adobe PDF, PLT, TIFF, PNG, CALS and CGM. Convert your files to Adobe PDF, PDF/A, TIFF, JPEG, CALS, DWF, DXF and other formats. 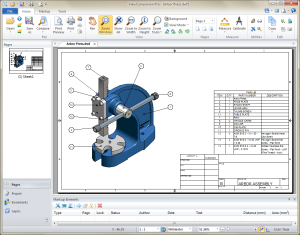 Combine files of different formats into a single multipage PDF, DWF or TIFF file. Batch convert and print all supported formats. Do precise measurements on the drawing. Annotate your files with rectangles, lines, dimension lines, area measurements, ellipses, polygons, text, arrows, stamps, freehand, symbols and images. If you need to distribute documents on the Internet, you can convert them to Adobe PDF, Autodesk Drawing Web Format (DWF) or Scalable Vector Graphics (SVG). All these formats are popular for distributing documents and drawings. You may use ViewCompanion to convert your DWF, PLT and CGM files to Autodesk DXF format which can be imported into any major CAD application. If you convert a DWF file to DXF all text in the DWF file will be converted to DXF MTEXT entities. All layers that are defined in the DWF file will be retained in the DXF. View your files fast and accurate with ViewCompanion. You have full control of zoom and pan with the use of mouse and keyboard. You will also find advanced viewing functions such as magnifier, overview window and compare. You may toggle between monochrome, color and grayscale view modes. Software Companions delivers three different editions of ViewCompanion: Standard, Pro and Premium. All of them can view, print and convert DWF files as well as other formats. The Pro and Premium editions add support for more file formats. You can find a comparison chart of the ViewCompanion family here. A fully functional evaluation copy can be downloaded from our web site. The downloaded product will run in evaluation mode for a period of 30 days. After this period you must purchase a license, if you want to continue to use the product. You can go directly to downloads here. Merge file from different formtats into a single PDF, DWF or TIFF file. Poster mode for printing drawings on multiple sheets, e.g. to print an A0 drawing in full size using multiple A4 sheets. Markup by using lines, text, rectangles, images, polygons, arrows, stamps, dimension lines and measurement areas. Define user Pen Table full control of colors, styles and widths for printing and conversion. Measure lengths and areas with snap to drawing geometry. Send a file as PDF, or in the original format, to another person by E-Mail from within the program. Shell Extension with full preview of supported file formats inside Explorer. 1. Supports CGM files using binary and clear text encoding. Supported profiles includes ATA, CALS, WEBCGM and CGM*PIP. 2. Supported TIFF compression methods: Uncompressed, Packbits, LZW, Inflate, CCITT G3 and G4. 100% Compatible with Windows 7, 8 and 10. This screenshot shows ViewCompanion with a file named Arbor Press.dwf loaded. This sample file is included in the installation. Click on the thumbnail to display a larger image. Your license includes software maintenance for one year that entitles you to download all updates made to the software, and to receive technical support. After this one year period ends, you may choose to remain with the last version downloaded, or you may renewal software maintenance for another year. More information about software maintenance can be found at the bottom of this page. All online transactions are handled by Share-It.com which is a service of Digital River Inc.
Share-It is using secure servers, and is one of the world's most popular software processing services. Free minor and major upgrades (for example from v10.x to v11.x). Highest priority for fixing reported problems and bugs. Software maintenance may be renewed annually after the first free year. Software maintenance is optional and you're free to choose not to continue the maintenance program. If you do not renew the software maintenance your license will continue to work as normal, but you will not be able to install and use the latest updates.